When the First Fleet set out from England in May 1787, their destination was Botany Bay, and it was there the infant colony was to be formed. 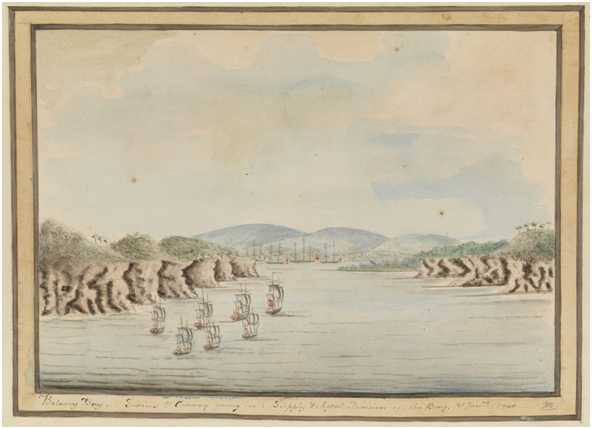 Captain Arthur Phillip sailed into Botany Bay on the 18 January 1788, the rest of the fleet arrived over the next two days after an eight-month voyage. Phillip very quickly ascertained that the location was far from ideal to form a settlement. 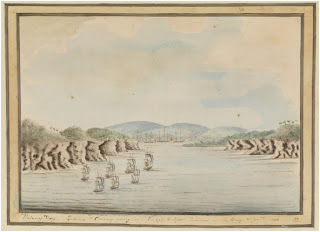 "The next care after landing was the examination of the bay itself, from which it appeared that, though extensive, it did not afford a shelter from the easterly winds: and that, in consequence of its shallowness, ships even of a moderate draught, would always be obliged to anchor with the entrance of the bay open, where they must be exposed to a heavy sea, that rolls in whenever it blows hard from the eastward. Several runs of fresh water were found in different parts of the bay, but there did not appear to be any situation to which there was not some very strong objection. In the northern part of it is a small creek, but it has water only for a boat, and the low lands near it are a perfect swamp. The western branch of the bay is continued to a great extent, but the officers sent to examine it could not find there any supply of fresh water, except in very small drains. Point Sutherland offered the most eligible situation, having a run of good water, though not in very great abundance. But to this part of the harbour the ships could not approach, and the ground near it, even in the higher parts, was in general damp and spungy. No place was found in the whole circuit of Botany Bay which seemed at all calculated for the reception of so large a settlement..."
"During our stay at Botany Bay, the Governor had made himself well acquainted with the Situation of the Land Nature of the Soil &c. &c. which he not finding so Eligible, as he could Wish, for the Purpose of forming a Settlement, He determined, before he fixed on it, to visit an Inlet on the Coast, about 12 Miles to the Northward of this Bay which, our great Circumnavigator, Captns Cook, discovered, and named, (in honour of one of the then Commissioners of the Navy) Port Jackson..."
Figure 1. ‘Botany Bay, Sirius & Convoy going in: Supply and Agents Division in the Bay. 21 Janry 1788’ From Bradley’s Journal.